SPEC MIX® Integral Water Repellent (IWR) Mortar is a dry preblended mortar mix which is specially formulated to reduce water penetration, shrinkage and efflorescence of masonry mortar joints. By incorporating a proprietary, dry polymeric integral water repellent admixture during the SPEC MIX manufacturing process, the designer, specifier, owner and contractor are assured the mortar on their project will repel moisture, while maintaining optimal workability and flexural bond strength. When using ASTM C 1357 “Test Method for Evaluating Masonry Bond Strength” to compare the flexural bond strength of SPEC MIX IWR Mortar to the same reference mortar mixed with the leading liquid admixture, the SPEC MIX IWR mortar demonstrated a 46 percent increase in bond strength. SPEC MIX® Integral Water Repellent IWR Mortar is a dry, preblended mortar mix that is produced using either Portland cement and hydrated lime, mortar cement or masonry cement with dried masonry sand and water a proprietary repellent admixture formulated for water repellency, superior bond, water retention and board life. Available in Types M, S and N, each meets ASTM C 270 and ASTM C 1714 requirements. SPEC MIX IWR Mortar is also available in standard and custom colors. 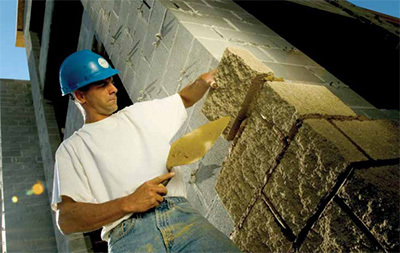 In addition to custom mix designs that are available for specific applications or properties, the standard IWR Mortar is designed to be compatible with the characteristics of the specified masonry unit. It is acceptable for all types of masonry construction with submittals available upon request. The mortar may be used above or below grade when manufactured to the appropriate specification.